Every week we sell multiple vehicles completely unseen to our customers around the globe. We are able to do this because our customers know that BAS machinery is a reliable business partner they can trust blindly. Our customers trust: our company, our values, our knowledgeable team, the quality of the information we provide both on- and offline, our full service, the appointments and agreements we make, and the respect we have for every single visitor. Our complete stock is available on our website with high quality detailed vehicle specifications often including video's and 360 degree pictures, and competitive prices. Every machine you can see on our website is available, and can be inspected in in our showroom or at the location of the vehicle. Please be sure to make an appointment in advance to avoid disappointment. When you buy a machine at BAS Machinery we always discuss all services and delivery terms possible. 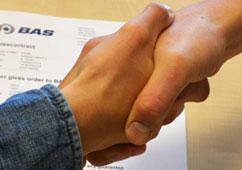 The final agreements are well documented in the sales contract to make sure there are no surprises for anyone. You'll be informed at all times through our customer portal customer portal "My BAS Machinery" In this portal you can see received payments, documents, and when transport or shipping is planned. You can always log in to your "My BAS Machinery" account to check the actual status of your order.